One a day to keep the doctor away? 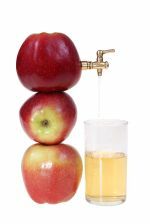 Apple juice offers benefits for a tonic, digestive, liver, stimulant, diuretic, detoxifying, laxative, antiseptic, lowers cholesterol, and are anti-rheumatic. They help to cleanse the system, lower cholesterol, keep blood glucose levels up and aid in digestion. The French use the peels in preparations for gout, urinary tract remedies and rheumatism. Used in fasts, apples aid to cleanse and off up vitamin A, C, B and G.
They are high in two important photo chemicals. Pectin helps lower cholesterol and colon cancer, and boron through to help prevent calcium loss, boost blood levels of hormone estrogen and appears to stimulate the electrical activity of the brain(increasing function and ability to perform tasks quicker and efficiently). They are the most versatile fruit! They are one of the only fruits that can safely be combined with all vegetables, and help to make all juices more palatable. In general, the greener the type the sharper its taste. Use the peel when juicing and remove the core. The core is optional, however, it is hard on all juicers. Remove the woody stem. When choosing one, it should be firm, have a sweet smell, free of holes and preferably organic as orchards historically tend to spray heavily. One pound is about 4 medium sized, and yields about 1 cup of juice. Rich in beta-carotene, folic acid, C, small amounts of B1, B2, B3, B6, biotin and E.
Rich in calcium, chlorine, magnesium, phosphorus, potassium, sulphur, small amounts of copper and zinc.